Oman can get hot. Really hot. And while the warmth makes the white-sand beaches all the more enticing, there’s another way to experience sweet relief from the sun; by travelling even closer to it. 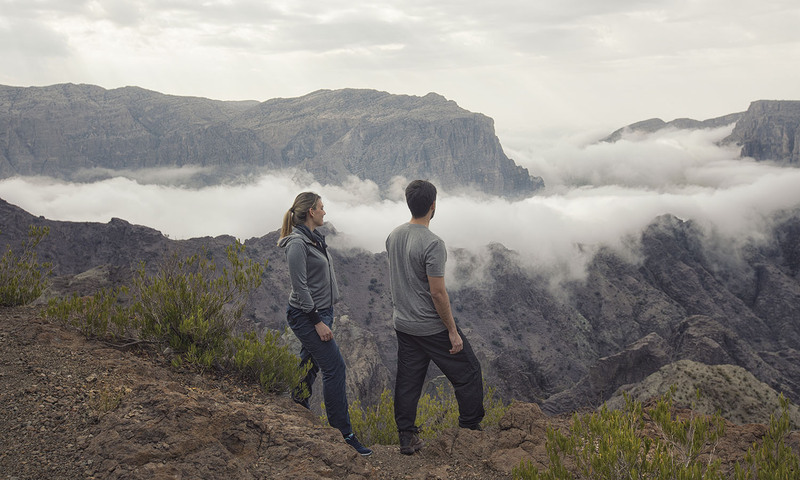 Head high into Jebel Akhdar, part of the immense Hajar Mountains, 2000-metres above sea level. Here a great canyon splits through rock and the temperatures drop more than 10°C. At first glance the region’s name, which translates to Green Mountain, may seem a little misplaced. But on closer exploration you’ll uncover valleys of fertile soil with orchids growing pomegranate, walnuts, figs and succulent stone fruit – think juicy apricots, peaches and plums. Terraced hills are scattered with bursts of colour in the form of Damask rose bushes, with their petals destined to be distilled into Omani rose water, and later infuse local sweets and traditional cosmetics. Ruins of mud-brick houses sit crumbling into the hills at Wadi Bani Habib, and date palms form oasis around them. This is the place to really get in touch with nature, and you’ll spot buzzing insects, vultures and warblers on a hike to the town and through the valley. After a couple of days exploring the mountain oasis of Jebel Akhdar that heat building up inside you will have dissipated, and you’ll be ready to embark back into the warmth of the lower grounds. Visit rugged Jebel Akhdar on the Active Oman trip with Swagman Tours. This tip was provided by Swagman Tours, but we’re sharing it with you because we think it’s great.